This is my eldest child....I had her when I was 12....no, not really.....I just can't imagine that I am the mother of someone that big...She started high school last week.....freaky I tell ya. TA DA! This is her belly button...that is Belly Button cookie. She found this great recipe in Better homes and Gardens magazine and has made herself quite famous. Everyone loves these cookies, they are so simple and so decadent. I have forbidden her to make them anymore, since they are solely responsible for five pounds. They really don't look like anything much, but trust me...they are. You are required to dip them in milk. with an electric mixer, combine the cream cheese, powdered sugar and extracts. Beat until smooth and set aside. With an electric mixer, beat the butter and granulated sugar together until smooth. In a bowl, whisk remaining dry ingredients together. Beat in vanilla and milk. Mix in dry ingredients. Divide the dough in half and chill, wrapped for at least thirty minutes. Preheat oven to 350 degrees. On a floured surface, roll out half of the dough until 1/8 of an inch thick. With a 3 inch cookie cutter, cut the dough into circles. Re roll scraps and repeat. Do the same with the second half of the dough. Place half of the circles on baking sheets. With a skewer, cut a small round hole in the center of the other half of the circles, and place on a baking sheets as well. Bake the cookies for 10-12 minutes or until golden brown. Let cool for a few minutes and then transfer to a wire rack and let cool completely. Spread the bottoms of the un pierced cookies with a dab of the cream and then top with a a cookie that has been pierced. Refrigerate to store. In a bowl, combine all of the ingredients, excluding 1/4 cup of the sweet and sour sauce. Smash all ingredients together well and form into a loaf on a foil lined sheet pan. Spread the remaining sweet and sour sauce over the top. Bake in a 350 degree preheated oven for 40 minutes or until the internal temperature reaches 165 degrees. Juices should run clear. Let sit for five minutes before slicing. You might remember this post a few weeks back. Here is a great recipe for home made Jello playdough. I am not sure where I found this recipe, but I have been making it on rainy days for years. Combine ingredients and cook over medium heat until it thickens and pulls away from the sides of pot and becomes dull. * Note: it burns easily so don't put over too high a heat and keep stirring. Mold and knead until cool enough to touch. Store in a closed plastic bag. 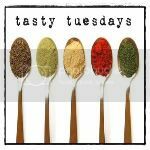 On my blogroll - 2nd entry! I wish you all could have won....but if you feel like skipping over there to congratulate her...you should because she has a cute little site. In the meantime, check out the recipe below, because it's just plain yummy. Louanne, shoot me an email and let me know where to send the card. Congrats! I used the Random Number Generator to get the winner, but I can't seem to figure out how to save the number it came up with so I can post it....do any of you geniuses know how? I have a "thing" for Asian inspired food. I know what you're thinking...Sara has a "thing" for lots of food....just last week she was waxing poetic about waffles. Well, true, true that is...I have plenty of things that tempt my tummy, but right now it's this dish. It is perfect for this time of year,because it takes literally ten minutes to compose. While soaking the rice noodles, you can completely prepare the rest of the dish. 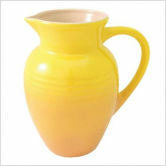 It is bright and tempting but also light, so you can go on your mid summer run not too long after ingesting it. This little pasta dish (is it ok to call it a pasta dish?...wait , no it's a noodle dish...right?) was inspired by Thai noodle dishes I have had in the past. My family loves edamame and so anything I sneak it in has a a better chance of survival, but this dish really hit the spot. The crunch of the water chestnuts and the rich sesame flavor is so yummy, and the lime juice finishes it off perfectly. You can pretty much add any vegetables you have, but I really enjoyed this mix. I typically use sirloin when I make stir fry. I beat it out with a mallet to tenderize it. But for this particular rendition, I had a leftover fillet Mignon and it was screaming out to me....and I am so glad it was. Bring 6 cups of water to a boil in a saucepan. Remove from heat and place the noodles in. let soak for ten minutes until noodles have softened. You want them to be soft but still have a little "bite". If you haven't entered my giveaway partnered with CSN online stores, you have a little less than 2 hours to do so. 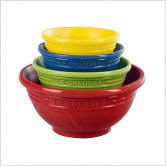 I am so exited to give the $40.00 gift card for Le Creuset away! Remember to enter, check out the details in this post,and enter on that same post. The winner will be announced tomorrow. Thanks to everyone who participated....I am so happy to meet all of my new Friends. Good Luck! Unfortunately, I have a nut allergy. I won't end up in the hospital (I don't think), but I get ridiculous canker sores in my mouth. This proves to be a problem for me, because I do love most nuts. The good news is that peanuts don't bother me...so maybe it's just an aversion to tree nuts. There is a reason I tell you this, because this nut nuisance had ruined my love affair with rocky road ice cream. Note, that I said "had", because I discovered a tasty substitute for the nuts. Early in the summer Dryers ice cream put out a "seasonal" flavor of S'mores ice cream. I didn't hesitate purchasing it, as I have a bit of a thing for marshmallows, chocolate and graham crackers. Let me tell you, it is nothing short of awesome! I know this for a fact, because I think I single handedly emptied out the local market's supply. First, the right marshmallow has to be used, not marshmallow whip. Mini marshmallows work fine, but I preferred to cut a large marshmallow up for looks (but it won't affect the taste). Second, I didn't want to use chocolate chips....I like flakes and flecks a bit more. I purchased a product called Magic Shell to achieve that texture. However, I don't love the waxy taste of that chocolate so maybe I'll try something else. Third, graham crackers aren't super sweet and I felt they would get lost in the ice cream and maybe a bit soggy. The Dryers version had an almost cookie like graham instead of cracker like. I purchased a Keebler pre-made graham cracker pie crust and broke it into pieces. It was definitely a great idea and super yummy! In a heavy saucepan, combine the milk, cocoa, and salt and scald. Meanwhile, beat the eggs and sugar together until light and fluffy. Temper the milk into the eggs carefully so as not to curdle the yolks. Cook the custard over medium heat, stirring constantly, for 4-5 minutes the mixture will bubble and thicken. 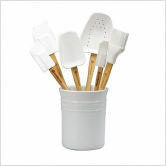 It should coat the back of a spoon and you should be able to run your finger through the custard and it will leave a clean line. Stir in the vanilla. Cool mixture completely-over night is always ideal, but at least a few hours. freeze according to your manufactures instructions. Remove the ice cream from the machine and transfer into a freezer container. Squeeze the chocolate shell in lines over the top and allow to set (it only takes seconds), Gently fold in the mix-ins and refrigerate for a few hours. I'm pretty rough on myself, so in the end I didn't quite think it hit the mark, although it was pretty good. However, my guests loved it...and there wasn't a drip to be licked. In hind sight, I think next time I will toast the marshmallows! Sounds like just the thing to step it up. 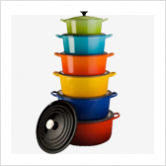 If you haven't entered my giveaway partenered with CSN online stores, please be sure to do so before Monday....I am so ecited to give the $40.00 gift card for Le Creuset away! Remember to enter, check out the details in this post,and enter on that same post. The winner will be announced Tuesday. Good Luck! I know this may be the longest post in the history of this blog....but hang in till the end.....there's something in it for you! So, there was a major lapse in postings from me a few weeks ago, and I mentioned that I had been busy with a wedding. Boy was I ever! This wedding would be the biggest that I have ever done. A sit down dinner for one hundred an hour before the reception for seven hundred! Yes, I said seven hundred! I have never taken on an event of this size or grandeur. The bride, is the daughter of well known successful entrepreneur and farmer here in Utah. I was excited to have the opportunity to showcase their beautiful produce. When we set the plans for the menu, it was January....and I hadn't quite considered the magnitude of this event, but as the months and finally the days neared...I have to admit I was panicking a bit. But with the help of my favorite business partner (mom), we pulled it together beautifully. To pull the event off, we had to rent a refrigerated trailer to hold all of the produce and eventually all of the finished product. This was the trailer after I packed it to head to the event. we had to bungee everything in, due to the fact that the event was held on a mountainside and there was a steep incline. We hired a staff of 12 for some of the prep and service. We prepared 150 pounds of roast beef, 150 pounds of ham, 150 pounds of turkey...I went through over 40 pounds of butter!! My mother and I with our meaty handiwork. My mother telling me "how it is" and me shutting up 'cause you know "how it is"
This is the site where the sit down dinner took place...I have no more pictures of this moment, because I was too darn busy to take any. I can tell you it was brilliant or should I say we were! I have been promised pictures to show off in the future. Twelve tables set perfectly for dinner to be served at 4:40 on the dot! So here are pictures of the buffet (in no particular order). have you noticed anything interesting in any of these pictures? Perhaps, like the guests are carrying around UMBRELLAS? AAACK!!!! Five minutes before we set down the food, the heavens opened up and began to downpour...and of course...the food table was not tented! Thus the weird placement of the crackers, rolls, and cupcakes. Oh, here is a shot of the strawberries....seen them before right? Mine were served on bejeweled soup spoons...so cute! Terrible picture but you get the idea. here is one of the few pictures I have of the main tent....as you can see, the weather ended up just beautiful. So did you manage to make it through my long slide show....I hope in the future to have a few pictures of the stuff I missed, because I was toooooo busy running around like a chicken with my head cut off! But since you were so very supportive, I would like to reward you..... 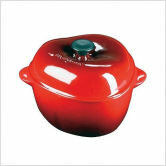 I am so excited that the CSN online stores contacted me and wish to give one of my readers a $40.00 gift card to be spent on a piece of Le Creuset! For those who do not speak French, we had better learn how to pronounce it first....it sounds like this....."Lay-crew-say". I love this cookware, and I am so excited that you get to have a peice....yes, I mean you...you know you want it! Look at just a few of the things below that you can spend your gift card on. 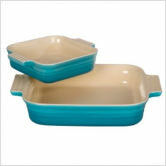 And to top it off, CSN is having a huge Le Creuset close out sale! First (Mandatory), visit CSN Le Creuset and shop. Then come on back here and leave me a comment and let me know what you can't wait to get your hands on. Second, follow me...and make sure you leave a comment to let me know you do. Third, link this blog post back to yours....if you do, I'll give you 3 more chances to win! Just make sure you leave 3 separate comments that you did. 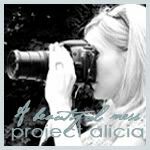 Fourth, add me to your blog roll...if you do, I'll give you 2 more chances to win! Just make sure you leave 2 separate comments that you did. And finally, visit any of the following blogs, and say Hi for me....if you do, leave a comment about who you visited. Giveaway will end Monday August 23, 2010 at 11:59 pm Mountain Standard Time. I will pick the winner a week from today (August 24th), by a random generator. So get busy...I hope you win...cause I love you like that!